You can use the PayPal buttons above to pay me your course fees by PayPal, but please also send me an email to tell me that you're paying and what you're paying for (so it's clear that you're giving me this money for a specific course on specific dates, and if you're paying for more than one place, tell me whom the additional place(s) is/are intended for). Thanks! I teach one- and two-day courses in Traditional Thai Massage, for beginner and more advanced levels. 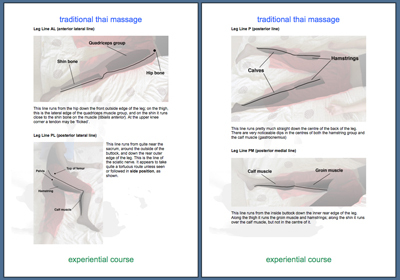 The Part I course (a two-day beginner's course) will give you a basic set of techniques so that you can give a Thai massage about 45 mins-1.5 hours long (although repetition of techniques will extend the massage and is in fact good practice), or incorporate new ideas and new approaches into your existing treatment if you're already a therapist. We work in pairs to practise the techniques; it's certainly 'hands-on'. There will also be talks on good massage practice (how to align your client, good posture, using your weight, knowing how far to go with pressure etc. ), how to put together and tailor a massage, the effects of a treatment, the history of this technique, how to deal with various situations and contraindications etc., essentially what you need to know to be able to go away and practise. Each student also receives a set of full course notes. These are printed in colour on high quality paper, and include photographs of each technique as well as explanations of fundamentals such as palming, the different positions, and preparation for massage. One-day workshops are also sometimes available; they are basically a shorter version of the Part I course. The workshop will give you enough technique to give a Thai massage about 30 mins-1 hour long (although, again, repetition of techniques will extend the massage and is good practice), or incorporate new ideas and new approaches into your existing treatment if you're already a therapist. Although I cover more than half the content of the Part I course in this workshop, there is only one day of teaching, so I cannot cover everything in as much depth. The course notes for the one-day workshop are only printed in black and white on normal paper (unlike the other courses where they are colour printed on matte photo paper). I also run more advanced courses (Part II) so that students can develop further in the technique. On Part II you learn new techniques and ideas, for example: energy lines (sen), side position, using different body parts for massage, and stomach massage (chi nei tsang). This gives you much more opportunity to tailor a massage to an individual's needs, as well as adding more freedom and fluidity to your technique, and a significantly deeper understanding of the principles of Thai Massage. We also practise health coaching and examine other factors that influence the effectiveness of treatment. A place on a two-day course typically costs £180, and there are only 10 places on each course. However, it is £20 cheaper (only £160) if you book your place more than four weeks before the course. A place on a one-day course costs £95, and it is £15 cheaper (only £80) if you book your place more than four weeks before the course. Currently I run courses at Bonnington Community Centre. The Bonnington Centre is just off Bonnington Square, immediately above the Bonnington Café, 5 mins walk from Vauxhall tube station and about 8 mins from Oval tube station; there is a Centre website, café website, and here is a map. I have run many of these courses now. It's really important to me that people enjoy the experience (for one thing, it makes people more likely to go on and practise), so I'm very gratified when, as is so often the case, my students leave the course relaxed, open, and happy. Clearly, practising massage with lovely people, and at the same time learning a new way to benefit others, tends to create a beautiful, positive experience.